Regulus Diving | Regulus is a diving shop in Hachijo is. Regulus is a diving shop in Hachijo is. One of the beautiful island in Japan “Hachijo Island”is located only 287km from Tokyo city which keep attracting tourists in the world. You can feel tropical island atmospheres here. You can enjoy with nature, underwater landscapes which was made by volcanos, variety of sea animals, and Hachijo Blue seawater !! The diving sites are for magical encounter with Japanese local fishes, turtles in all years. Let’s indroduce you Black-silk Butterfly fish called YUZEN which can be seen in Hachijo and Ogasawara Islands. Japanese Pygmy angelfish, Japanese Swallow, and other local fishes also should be seen in Japan. Water temperature and visibility are influenced by the Kuroshio Japan Current. Temeprature changes from 15℃ to 30℃, visibility is from 10m to 30m. Please make sure to check the wetsuits outfit before you visit here. We are always willing to help you for your wonderful diving trip! How many sea turtles you want to encounter? Only one dive in Hachijo is enough to see many green sea turtles. Hachijo may be the best area in the world for the divers who love turtles. If you want to meet with sea turtles, you have better come to Hachijo Island NOW! 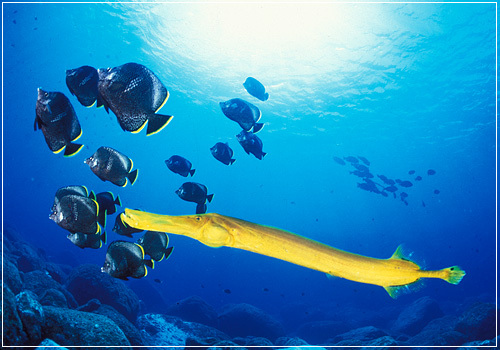 There are many kinds of fish that you will never see in other diving areas. Especially the black-silk butterflyfish are indigenous to Hachijo and Ogasawara Islands. You will be able to see many variety of fishes and be attracted by beautiful sea life in Hachijo blue!! Copyright© Regulus Diving All Rights Reserved.